The key message from the function was Hinduism is a global legacy, with Bhagwat saying that it is not an “ancestral property” of Indians, but it is for everyone. Vice-President Hamid Ansari, RSS chief Mohan Bhagwat, HRD Minister Smriti Irani, prominent Islamic leaders and a Bollywood actor — they all came under one roof on Friday to launch the international edition of Encyclopedia of Hinduism. “Religion always unites and what divides people is not religion,” he said. 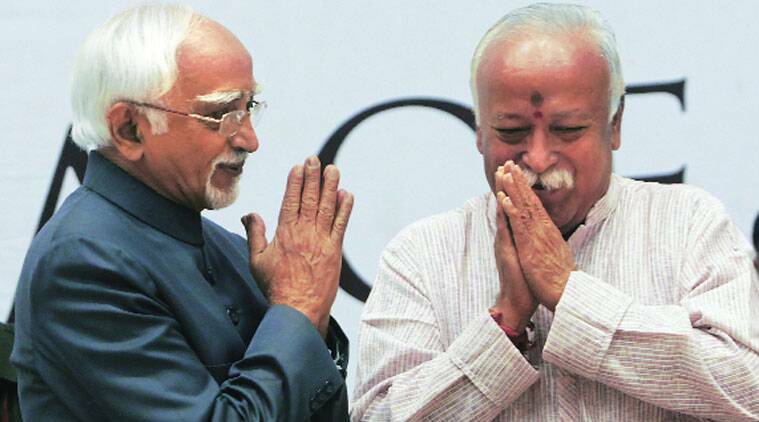 Interpreting the word “dharm”, the RSS chief said it has a wider meaning than “religion”. According to Bhagwat, the Encyclopedia on Hinduism, a project of India Heritage Research Foundation, would help Hindus as well as Indians answer the questions asked about the religion to the next generation and the outside world. Swami Chidanand Saraswati, the founder chairman of the IHRF and spiritual head of the Parmarth Niketan in Rishikesh, stressed that no one can stake claim on Hindu religion. “The wisdom, truths, teachings and insights of Indian and the Hindu culture are not limited to only Hindus or Indians. Rather they belong to the world and can deeply benefit the world,” he said. Imam Umer Ahmed Ilyasi, president All India Imams Organisation, and Dewan Syed Zainul Abedin Ali Khan, Ajmer Darga Sharif, said Hinduism is an “assimilative” religion. Vice-President Ansari, the chief guest at the function, spoke on the history of encyclopaedias. “Available evidence shows that the encyclopaedia ‘industry’ is now flourishing. One count puts the figure of these in the market at anything between six and ten thousand. At this rate, there may even be a need for an encyclopaedia of encyclopaedias,” Ansari said.